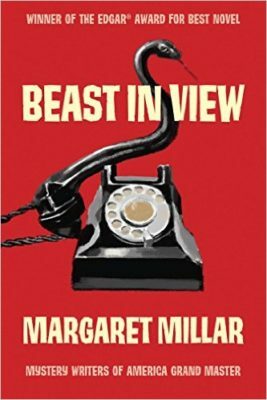 The following is an exclusive excerpt from Beast in View, Margaret Millar’s Edgar-winning novel of suspense, first published in 1955, and now reissued by Syndicate Books through Soho Press. In this scene, a woman receives a phone call from a malevolent force linked to her own dark past, and enlists a low-rent private eye to assist. “I have a great many friends,” Miss Clarvoe lied. In the mirror above the telephone stand she saw her mouth repeating the lie, enjoying it, and she saw her head nod in quick affirmation—this lie is true, yes, this is a very true lie. Only her eyes refused to be convinced. Embarrassed, they blinked and glanced away. “Me.” Helen Clarvoe turned back to the mirror. It was round, like a crystal ball, and her face popped up in it, an old friend, familiar but unloved; the mouth thin and tight as if there was nothing but a ridge of bone under the skin, the light brown hair clipped short like a man’s, revealing ears that always had a tinge of mauve as if they were forever cold, the lashes and brows so pale that the eyes themselves looked naked and afraid. An old friend in a crystal ball. “Yes.” It was another lie, easier than the first. The name meant nothing to her. It was only a sound, and she could not separate or identify it any more than she could separate the noise of one car from another in the roar of traffic from the Boulevard three floors down. They all sounded alike, Fords and Austins and Cadillacs and Evelyn Merrick. Miss Clarvoe’s arm reached out and swept the telephone off the stand. It lay on its side on the floor, unbroken, purring. Miss Clarvoe sat, stiff with terror. In the crystal ball of the mirror her face was unchanged, unmutilated. The forehead was smooth, the mouth prim and self-contained, the skin paper-white, as if there was no blood left to bleed. Miss Clarvoe’s bleeding had been done, over the years, in silence, internally. When the rigidity of shock began to recede, she leaned down and picked up the telephone and placed it back on the stand. She wanted to say, Give me the police, the way people did in plays, very casually, as if they were in the habit of calling the police two or three times a week. Miss Clarvoe had never called the police in her life, had never, in all her thirty years, even talked to a policeman. She was not afraid of them; it was simply a fact that she had nothing in common with them. She did not commit crimes, or have anything to do with people who did, or have any crimes committed against her. Miss Clarvoe hung up. She knew how to deal with June and others like her. One hung up. One severed connections. What Miss Clarvoe did not realize was that she had severed too many connections in her life, she had hung up too often, too easily, on too many people. Now, at thirty, she was alone. The telephone no longer rang, and when someone knocked on her door, it was the waiter bringing up her dinner, or the woman from the beauty parlour to cut her hair, or the bellboy, with the morning paper. There was no longer anyone to hang up on except a switchboard operator who used to work in her father’s office, and a lunatic stranger with a crystal ball. She had hung up on the stranger, yes, but not quickly enough. It was as if her loneliness had compelled her to listen; even words of evil were better than no words at all. She crossed the sitting-room and opened the French door that led on to the little balcony. There was room on the balcony for just one chair, and here Miss Clarvoe sat and watched the boulevard three flights down. It was jammed with cars and alive with lights. The sidewalks swarmed with people, the night was full of the noises of living. They struck Miss Clarvoe’s ears strangely, like sounds from another planet. A star appeared in the sky, a first star, to wish on. But Miss Clarvoe made no wish. The three flights of steps that separated her from the people on the boulevard were as infinite as the distance to the star. June arrived late after a detour through the bar and up the back staircase which led to the door of Miss Clarvoe’s kitchenette. Sometimes Miss Clarvoe herself used this back staircase. June had often seen her slipping in or out like a thin, frightened ghost trying to avoid real people. The door of the kitchenette was locked. Miss Clarvoe locked everything. It was rumored around the hotel that she kept a great deal of money hidden in her suite because she didn’t trust banks. But this was a common rumor, usually started by the bellboys, who enjoyed planning various larcenies when they were too broke to play the horses. June didn’t believe the rumor. Miss Clarvoe locked things up because she was the kind of person who always locked things up whether they were valuable or not. June knocked on the door and waited, swaying a little, partly because the martini had been double, and partly because a radio down the hall was playing a waltz and waltzes always made her sway. Back and forth her scrawny little body moved under the cheap plaid coat. June put her hand on the door jambs to steady herself. Miss Clarvoe led the way down the hall into the sitting-room and June followed, looking around curiously now that Miss Clarvoe’s back was turned. But there was very little to see. All the doors in the hall were closed, it was impossible to tell what was behind any of them, a closet or a bedroom or a bathroom. Behind the last door was the sitting-room. Here Miss Clarvoe spent her days and nights, reading in the easy chair by the window, lying on the divan, writing letters at the walnut desk: Dear Mother: I am well . . . glorious weather . . . Christmas is coming . . . my best to Douglas. . . Dear Mr. Blackshear: Regarding those hundred shares of Atlas . . . Her mother lived six miles west, in Beverly Hills, and Mr. Blackshear’s office was no more than a dozen blocks down the boulevard, but Miss Clarvoe hadn’t seen either of them for a long time. June sat down in the easy chair by the window and Miss Clarvoe watched her, thinking how much she resembled a bird, with her quick, hopping movements and her bright, greedy eyes and her bony little hands. A sparrow, in spite of the blonde hair and the gaudy plaid coat, a drunken sparrow feeding on sherry instead of crumbs. And, watching June, Miss Clarvoe wondered for the first time what Evelyn Merrick looked like. They were the final words of the interview. There were no thank-you’s or farewells or see-you-soon’s. Miss Clarvoe rose and unlocked the door. June darted out into the corridor. And Miss Clarvoe was alone again. I don’t remember, is all. Miss Clarvoe sat down at the walnut desk and picked up the gold fountain pen her father had given her for her birthday years ago. She wrote: Dear Mother: It has been a long time since I’ve heard from you. I hope that all is hell with you and Douglas. She stared at what she had written, subconsciously aware that a mistake had been made but not seeing it at first. It looked so right, somehow: I hope that all is hell with you and Douglas. I meant to say well, Miss Clarvoe thought. It was a slip of the pen. I hold no resentment against her. It’s all this noise—I can’t concentrate—those awful people next door. . .
Miss Clarvoe closed and locked the French doors. Perhaps that’s what the telephone call was, she thought. Just a joke. Just someone, probably someone who worked in the hotel, trying to frighten her a little because she was wealthy and because she was considered somewhat odd. Miss Clarvoe realized that these qualities made her a natural victim for jokers; she had become adjusted to that fact years ago, and behind-the-hand snickers no longer disturbed her the way they had in school. It was settled then. The girl with the crystal ball was a joke. Evelyn Merrick didn’t exist. And yet the very name was beginning to sound so familiar that Miss Clarvoe was no longer absolutely certain she hadn’t heard it before. She pulled the curtains closed across the windows and returned to her letter. I hope that all is hell with you and Douglas. She crossed out hell and inserted well. I hope that all is well with you and Douglas. I don’t though. I don’t hope anything. I don’t care. She tore the sheet of paper across the middle and placed it carefully in the wastebasket beside her desk. She had nothing really to say to her mother, never had, never would have. The idea of asking her for advice or comfort or help was absurd. Mrs. Clarvoe had none of these things to give, even if Helen had dared to ask. The party in the next room had reached the stage of song. “Down by the Old Mill Stream.” “Harvest Moon.” “Daisy, Daisy.” Sometimes in close harmony, sometimes far. A hot gust of anger and resentment swept through Miss Clarvoe’s body. They had no right to make so much noise at this time of night. She would have to rap on the wall to warn them, and if that didn’t work she would call the manager. She started to rise but her heel caught in the rung of the chair and she fell forward, her face grazing the sharp edge of the desk. She lay still, tasting the metallic saltiness of blood, listening to the throbbing of the pulse in her temples and the panic beat of her heart. After a time she pulled herself to her feet and moved slowly and stiffly across the room towards the mirror above the telephone stand. There was a slight scratch on her forehead and one corner of her mouth was bleeding where the underlip had been bit by a tooth. A cry for help rose inside Miss Clarvoe’s throat. Help me, someone! Help me, Mother—Douglas—Mr. 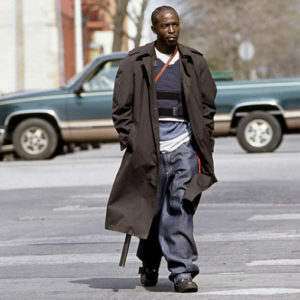 Blackshear. . . But the cry was never uttered. It stuck in her throat, and presently Miss Clarvoe swallowed it as she had swallowed a great many cries. I am not really hurt. I must be sensible. Father always boasted to people how sensible I am. Therefore I must not become hysterical. I must think of something very sensible to do. She went back to her desk and picked up her pen and took out a fresh sheet of notepaper. You may recall that, at my father’s funeral, you offered to give me advice and help if the occasion should ever arise. I do not know whether you said this because it is the kind of thing one says at funerals, or whether you sincerely meant it. I hope it was the latter, because the occasion, you may have already inferred, has arisen. I believe that I have become the victim of a lunatic. . . .
Excerpted from Beast in View, copyright © 2018 by Soho Syndicate. Reprinted with the permission of the publisher, Soho Syndicate. All rights reserved.